Rio has his first equine bodywork session at the beginning of January, and he just had his first follow-up session yesterday. Going forward we plan to stay on a consistent once a month schedule to keep a pulse on how he is feeling, and monitor the development of any problem areas that could indicate the need for a change in his program. 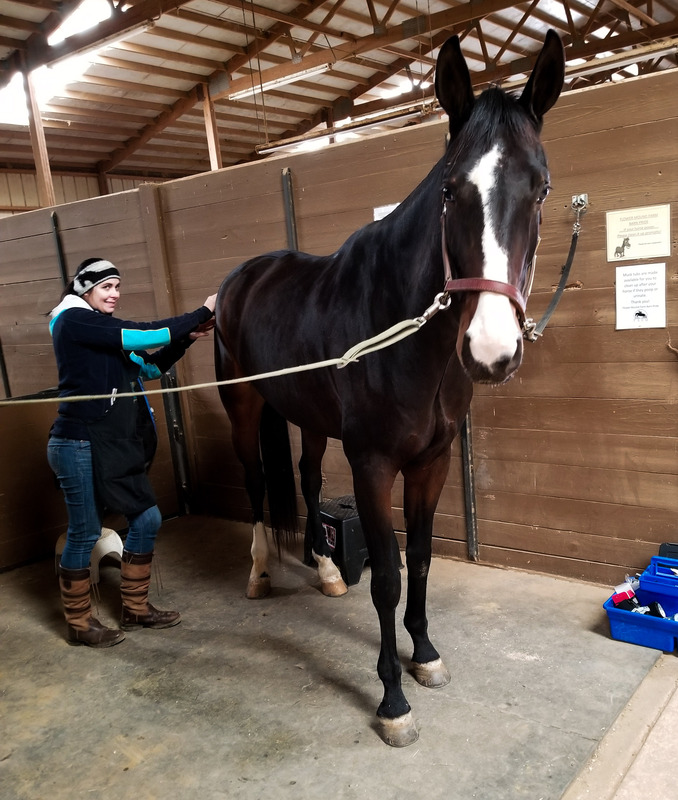 He had a few ‘problem’ areas during his first equine bodywork session, where he was particularly tight, but I am happy to report he was overall MUCH better this time. I think a lot of that has to do with him getting his hocks injected 2 weeks after his initial bodywork session. He was probably compensating for his hocks in other areas, which was causing tightness that usually isn’t there. Now that he is freshly injected and feeling better, his musculature is telling a much better story. The amazing Christy had lots of good things to report. His hamstrings are nice and soft, his back (particularly the lumbar region) is much more relaxed with less heat. His stifles feel better, and he feels good in his shoulder/thoracic outlet area. Christy did say he still has a little bit of heat in his back under the saddle area. I am really hoping my Voltaire gets here soon, and that it improves the issue. She also taught me how to get him him to stretch his back (along his spine and under his belly) and I am going to try to start incorporating carrot stretches after rides. He’s pretty dang flexible and happy right now, and we want to keep him that way! I haven’t been doing any jumping lately, and I haven’t had a lesson in a few weeks. It’s possible the decreased work load has his helped too. I’ve been doing more lateral work to try and increase his ab and back strength as well. More legs yields, more haunches in and shoulder in. He does turns on the haunches pretty well from tracking right to left, and half passes decently to the right, but the left is another story. I have been focusing more on strengthening that side, and insisting on a few good steps of turn on the haunches from left to right, and half pass to the left. He does not love it, but I do think it is helping overall. I haven’t really forced the issue up until now, but I finally decided that the one sidedness needs to be addressed and is only going to get worse if I only go the easy direction. Obvious I know, but I can’t help that I don’t like to force the hard stuff. Sue me. Christy also has me on the kinesiology tape train. I will be honest, I doubt the effectiveness of it. A lot. There is basically no scientific research that proves that it does anything. But, Christy is a big believer in it, and travels all over the US working on horses. If she has seen it make a difference, then I am willing to give it a try. I also wasn’t originally sold on equine bodywork, and now I’m a convert. Rock tape is $18 on Amazon prime, so it’s not like it’s a huge investment, especially compared to everything else I spend money on for Rio LOL. She recommends taping for every ride (it stays on 3-4 days). She only wants me t0 tape in the poll area bilaterally (about a 4 inch long strip) and along the lumbar area bilaterally (about 10-12 inches). So it’s not a lot, and it’s nothing fancy. We also discussed Rio’s right hind (spider bite/splint bone fracture leg). It is basically permanently puffy in the pastern ever since all that happened. It goes down with turnout and work (I polo wrap it to ride), but it always comes back. And sometimes it gets kind of hard. It is not severe swelling by any means, so I really don’t worried about it too much, but Christy doesn’t want it to become an issue long term and inhibit his movement if scarring develops in the fascia layer. She showed me how to tape that area as well, which in theory will help bring down the swelling. This is the big test for me, because it is something I can SEE. I should be able to tell if it actually improves or not. Let the test begin! And here is a cute little video of Rio enjoying his session! Not pictured is Christy doing her equine bodywork magic on him off camera. So what do you guys think of kinesiology tape? Have you ever tried it? Did you think it made a difference? What all did you tape? Eli loves his massage therapy, too. As for kinesiology tape … I tried on me for quite some time on my wrists in different configurations and never really noticed much improvement. Compared to a compression thing I have for my right wrist, the compression thingy makes a much greater difference. But I’d feel weird putting compression anything on my horse, so maybe the tape is a better option for them? So does the tape come off hair easily? That would be my main concern. Christy said to leave it on until it starts coming off by itself. Last time she came I left it on about 3 days and then it pulled off super easy actually (it had sand and stuff stuck to it by then). I wouldn’t want to pull it off right after applying though. Interesting that you didn’t notice too much of a difference. I may try it on myself to see how it goes! I’ll be doing a full post on this, but I JUST learned about a new product called Nu Bandage at a vet convention last week that is a compression bandage specifically for horses. They come in high, med and low compression, are vented and washable. I picked one up for Doc’s windpuffs and I think it sounds like Rio’s leg would be perfect for it. Elite (https://www.elitevetproducts.com/products/equine-nu-bandage) is the distributor for equine right now and I’m sure they would work with you on deciding a level of compression, etc.! Ok this is REALLY cool! I have never heard of this product. I just may email them with a few questions- it’s a great price point too! I’ve had good luck with the tape in the past loosening a huge knot in Bobby’s back. My only problem with it is getting it to stick reliably, but that might just be me not putting it on exactly right. Glad to hear it! Have you tried the Rock Tape H2O? That is what my bodyworker recommended, she said she feels it sicks the best. I haven’t tried tape on either myself or my horse, though I know a lot of my runner friends believe it helps. If you want something else to spend money on, have you tried Back on Track wraps for his puffy leg? I Loveeeee BoT products. I have the mesh sheet, the quick wraps, and the hock boots. Currently, my barn isn’t super thrilled about taking them off for me in the mornings though, so I try not to over do it. I am moving to a new barn soon though, so hopefully I will get to utilize them more. i had the tape used on me for my PT for my heel spur and plantar facitis (god i can’t spell that LOL) and it did help!! So i think it is worth trying! !I left mine on for 2-3 days (even showered in it) and usually by the time i was heading back to PT i took it off. I swear even if it was a placebo effect it seemed worth it. Glad you are getting him all straight before Spring is here. Yay! Glad to hear you feel that it made a difference. I am actually excited to try it- anything that could help keep Rio feeling book if awesome in my book.